Today the FT has an article covering the subject that we covered in a piece of research in October – the underperformance of “most loved” stocks versus “least loved”. The FT looked at the UK market across all sectors and showed exactly what we showed in the chemical space in the US – that the least loved group outperforms the most loved. 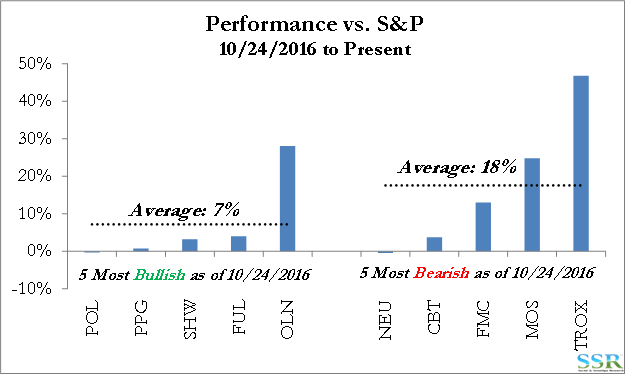 We have looked at the performance of the stocks that we identified back in October and what we showed at the time has continued. The 5 most loved Chemical stocks at the time have underperformed the 5 least loved by 11% on average (in a little over 3 months).